John Rodwell was born in Colsterworth c1896. His parents were John Thomas Rodwell (born Frisby, Leicestershire) and Sarah Ann Bamford (born Northamptonshire). They married in Billesdon, Leicestershire in 1891 and lived in Frisby for about several years before moving to School Lane in Colsterworth. John Thomas had been an apprentice grocer (in Harby) in 1881, but later worked as a labourer on a cattle farm. In 1909 he was summoned for using obscene language outside the White Lion at Colsterworth, in front of several females. He was fined 10/ and costs. Later in 1909 he was charged with being drunk and disorderly at Great Ponton. Sgt Kettles found Rodwell in the middle of the road at 2pm, waving his arms and swearing. He was arrested and taken to Grantham. He pleaded for leniency and promised never to take another beer. But after being released out on bail he got drunk again and his wife had to send for a policeman. He was fined 10/ and 5/ costs. In 1930 (still of Colsterworth) he was summoned again for using obscene language. He had 16 previous convictions, 15 of them for using obscene language and being drunk; although his last time in court had been 1917. 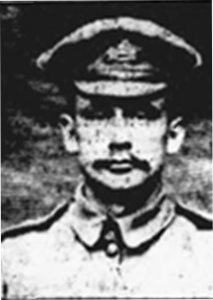 John (junior) joined 8th (Service) Battalion, Lincolnshire Regiment in 1914. In Sep 1915 the New Army battalion sailed to France and just 2 weeks later it was thrown into the Battle of Loos, where it suffered heavy casualties. Nearly half the men (and nearly all the officers) were killed, wounded or missing. Rodwell (now promoted to L/Cpl) was killed by a shell on 22nd (or 23rd) October 1916. According to a letter sent to his family he was buried behind the line. But he now has known grave and is commemorated on the Thiepval Memorial.